Practical and concise, this spiral bound, pocket-sized manual is a quick, go-to reference for up-to-date clinical material on today’s diagnostic testing and laboratory tests. Three convenient sections provide quick access to key information on clinical laboratory testing, diagnostic imaging, and diagnostic algorithms. 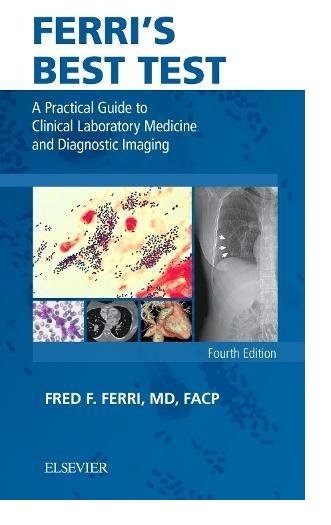 Experienced author Dr. Fred Ferri uses a unique, easy-to-follow format to simplify complex information and help you choose the best test to supplement your clinical diagnostic skills. Includes both lab and imaging tests for concise, convenient access to all diagnostic test options for more than 200 common diseases and disorders.Includes essential information on indications, advantages, disadvantages, approximate costs, normal ranges, typical abnormalities, likeliest causes, and more.Features a new appendix on when to use contrast agents in ordering CT and MRI scans. Discusses new modalities including transient elastography (Fibroscan), CT enterography and CT enteroclysis. Provides new comparison tables to easily evaluate the best test; new algorithms for evaluation of immunodeficiency and hematochezia; and new tables and illustrations throughout to improve your test selection. Expert Consult™ eBook version included with purchase. This enhanced eBook experience allows you to search all of the text, figures, and references from the book on a variety of devices.